Japan extended the following assistance to Kazakhstan in establishing the state safeguards system and physical protection of the facilities based on the IAEA Coordinated Technical Support Plan. Flow monitor equipment was provided to the “BN350″ fast-breeder reactor in Aqtau, a city near the Caspian Sea, in order to monitor the removal of spent nuclear fuel from the nuclear reactor. An accounting and control program, computers, and LAN equipment were provided to the “BN350″ reactor. Reactor site entry/exit control system (turnstile gates, metal detectors, x-ray scanners, TV monitoring system, etc. ); reactor building entry/exit control system equipment (remote-controlled doors, code-controlled doors, open/close detectors, TV monitoring system, etc. ); and radiation meters were provided to the “BN350″ reactor. A building entry/exit control system (card readers, electronic locks, etc.) and a surveillance system (door sensors, passive sensors, etc.) were provided to the Atomic Energy Committee in Almaty. An entry/exit control system (card readers, turnstile gates, etc. ), a surveillance system and infrared instruments were provided to the Institute of Nuclear Physics of the National Nuclear Center in Alatau, located outside of Almaty. A nondestructive measuring device used for IAEA inspections was provided. 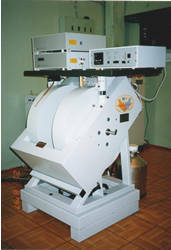 The following equipment was supplied for the treatment of people who participated in the elimination of contaminated waste from the Chernobyl Nuclear Power Plant during the Soviet era, as well as those who were exposed to radiation in the area surrounding the Semipalatinsk Nuclear Test Site: CT scanner, an x-ray diagnostic system, a gamma camera, an ergometric treadmill system, an ultrasound scanner with doppler, an electroencephalograph, a clinical chemistry analyzer, an ophthalmological treatment unit, a ENT treatment unit, a bacteriological antibiotic sensitivity system, fiber-scopes for the upper digestive tract, the duodenum, the colon, and the bronchi, a cystoscope, a sigmoidoscope, a mobile endoscope, a ventilator, etc. This hospital was founded in 1943 for the treatment and rehabilitation of servicemen wounded in the Great Patriotic War (Russo-German War). At present however, its main function is the diagnosis and treatment of people exposed to nuclear testing radiation. Aid was given for the establishment of a remote medical diagnostic support system to offer medical support by connecting via satellite the Semipalatinsk Medical College, which is the leader of medical instruction in East Kazakhstan State where the Semipalatinsk Nuclear Test Site is located, to the School of Medicine at Nagasaki University, which promotes the international medical support project for people exposed to radiation. Ultrasonic diagnostic equipment, a biological microscope, an INMARSAT (satellite transceiver), an antenna platform, a P110 color monitor, a color medical still image recorder, videophones, etc., were provided. 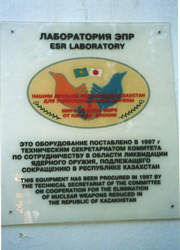 The following equipment was provided to the Semipalatinsk Nuclear Medicine and Environment Research Institute, which has been conducting ongoing diagnostic investigations on the state of health of the local inhabitants exposed to radiation in the area surrounding the Semipalatinsk Nuclear Test Site. An inverted microscope, a carbon dioxide generator for cultivation of lymphocytes for chromosome observation, a centrifugal blood separator, an automatic blood cell counter, an autoclave for sterilization, and a medical freezer.